Crunching numbers and trying to read trends seems like an exhausting thing to do, doesn’t it? All that stress and anxiety is probably quite deleterious. Luckily, Offwolrd Trading Company offers all that and more in the form of a video game, so you can destroy as many companies as you want guilt free! In Offworld Trading Company, Earth has become non-sustainable for its population. More resources and living space is needed, and the natural choice is Mars. These are the early days of colonization, which means there are chances for everyone to succeed, and most Earth rules of conduct still do not apply. The man behind Civ IV’s lead design played a key part in Offworld’s development, and it shows. Offworld Trading Company has that same excitement you feel early on in Civ, where nothing is really set and a few bad moves mean it’s game over. The gist of the game is quite simple, really. Using your headquarters, you need to send your drones to gather resources from the nodes around you. These resources, like aluminum and water, can be used for various things. You can upgrade your base and build new buildings. The main goal of the game is to acquire the most resources and buy out your opponent, ensuring you are the only corporation remaining on Mars. The main complexity factor of the game stems from how one can achieve that. While the basic gameplay loop of get stuff, sell them, make money, win is easy to get, there are a few extra steps and gimmicks. For example, You always need to plan ahead on how you build and expand your base, since specific buildings get bonuses when placed close to others. Moreover, you can meddle with other corporations, depending on what corporations you represent. You can stage strikes and cut off power to your opponent’s factory. Generally, while every corporation you can play as has the same goals, they all have enough differences among them to give the game great replayability. Apart from all the dirty plays you can launch on your opponents, another great way to beat them is to simply affect the market. Basically, the reason you make all the resources you make is to give them to one of the planet’s colonies. Of course, that won’t happen for free. The market is always going up and down, depending on the colony’s needs.The way you choose to use your stockpiles greatly affects this. For example, you can choose to flood the market with a resource, dropping its price greatly. While this means that you’ll probably lose a bunch of money, if your opponent has more of said resource, it’ll suddenly be almost dead weight to him. You can also choose to hold on to a resource until its price goes way up, risking your opponents offering the resource for cheaper. The strategies I mentioned are only low level ones. There’s much more to find and use in the game. I almost never talk about a game’s tutorial, but I feel like it is needed here. 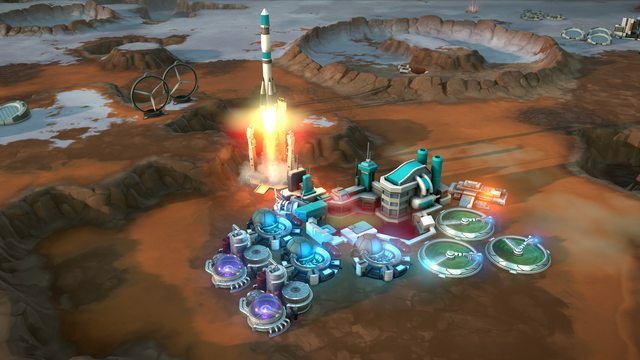 Offworld Trading Company is a complex game, with strategy layer upon strategy layer. It seems very intimidating at first, but the tutorial does a great job of clearing stuff up while giving you some great tips for the future. Through the tutorial levels, you will assume controls of various corporations and learn their strengths and weaknesses. Thanks to some very fun dialogue, the experience is much more enjoyable than a stale tutorial. Even if you have some idea about how similar games play, I”d really recommend playing the tutorial first (huge shoutout to the level that actually taught me taking on debt is a good idea). In terms of graphics and sound, the game is satisfactory. The music and the sound effects are exactly what you would expect from a futuristic corporation, while the graphics are quite pretty to look at, especially the robots that carry your resources. You might want to not zoom all the way in if you have a high quality screen though, as the game might look pixelated. The only really negative thing I have to say about the game is about its difficulty. It seems like something is off in the way it is scaled. I get that the game is supposed to be hard, at least in the beginning. However, it seems weird to me that by upping the difficulty by one margin makes me inept at the game suddenly. I think the curve should be a bit less steeper. Apart from that though, Offworld Trading Company is a great game. Granted, its subject matter is not something that everyone will like, since it leans very close to the “I need a spreadsheet to play this” camp. Still, for those interested and well-versed in the genre, it can offer you everything you’d need, which makes it a great get. You can find Offworld Trading Company on Steam, where it is 66% off until the 20th of February. Offworld Trading Company is a great resource management strategy game with good replayability. It is only hindered by its difficulty curve, but that is not enough to distract from its well-made systems.